The midland game fair at Weston Park, Shropshire is the last big show of the year, so whilst you’re grabbing a bargain come and see us. 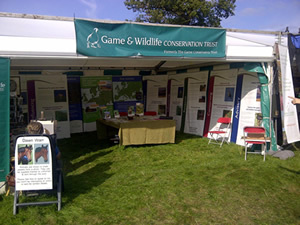 Our stand is bigger this year and we have some exciting attractions for you to come and see. We're at stand No. A 122 on Gunmaker’s Row. Our advisory department will have a snaring demonstration showing good and bad practice – why not show off your knowledge and see if you can spot the difference. We will have prizes available. Game & Wildlife Advisor Austin Weldon will be available on the Saturday to help you with shoot and wildlife management questions. Dave Butler, owner of Perdix Wildlife Supplies will be showcasing his wildlife management products. You can talk to him about feeders, security cameras and his range of traps amongst lots of other stuff. Dawn Warr, taxidermist and artist will be exhibiting her work. This is a great opportunity to talk to Dawn and see her wonderful pet portraits. Steve Richardson and David Thurgood will be on-hand to talk to you about the work of the Trust and the benefits you gain from joining if you haven’t already done so. You will also have a chance to sample the new William Chase sloe gin which we issue to GWCT shoot sweep donors. If you're coming to the Midland Game Fair visit our stand and pick up your FREE copy of Gamewise - our glossy members' magazine.